Sardinia’s northeast sparkles with beaches, protected islands and a parade of luxury yachts plying its translucent seas — and it’s also a favourite spot for letting your inner child splash out and get gloriously wet. Join your yacht in Sardinia’s hub, glamorous Porto Cervo, named after its antler-shaped cove. 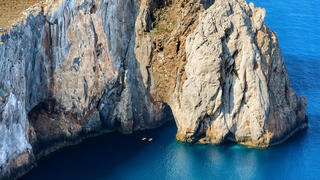 Jet Ski, windsurf and kayak along its jagged coastline, part of the Costa Smeralda (Emerald Coast). Afterward, test your land legs by wandering its boutiques; strolling to Stelle D Stelle restaurant, where 10 Michelin-star chefs will alternate for a week each between mid-June and mid-September; and dancing under the stars at Phi Beach, an open-air beach club west of Porto Cervo. From here, cruise south to Cala di Volpe Bay, where you can waterski and kayak before stepping ashore for cocktails at Hotel Cala di Volpe’s Bar Pontile, the setting for the 1977 film The Spy Who Loved Me. Continue south to Portisco, Porto Rotondo and Golfo di Marinella for more James Bond style glamour and beach exploration, then backtrack north and explore Maddalena Archipelago National Park’s seven predominant isles and more than 50 smaller isles and islets via tender. If you’ve obtained a permit, go scuba diving off the island of Caprera. For traditional cuisine, including Sardinian suckling pig, drive 20 minutes southwest of Porto Cervo to La Sasima, in San Pantaleo — one of the best rustic restaurants in the Mediterranean. Tastings of wines, cheeses, honey and salami — all produced on site — are also available. Carl Sputh, captain of Starfire, recommends Greece’s northern Ionian Islands — Corfu, Paxos, Antipaxos and the Sivota Islands — for embracing your yacht’s water toys. “Corfu is a nice cruising ground; you can always find calm water [for watersports],” explains Sputh. 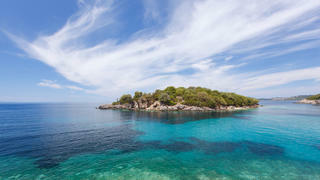 And, he continues, you can easily circle around 11.6-square-mile Paxos and two-square-mile Antipaxos with Jet Skis. And while you probably shouldn’t use Jet Skis and waterskis between the tiny Sivota Islands (Mavro Oros, Agios Nikolaos, Mourtemeno and Mikro Mourtemeno) you can run them outside, says Sputh. These islands lie just off the mainland village of Sivota, opposite southeastern Corfu, and are often busy with swimmers and smaller boats. Sputh also recommends using Seabobs around the southern part of Mavro Oros up to its Blue Lagoon. Begin your weeklong vacation on Corfu’s east coast, in Corfu Town (Kerkyra). While here, explore UNESCO World Heritage-listed Old Town of Corfu, which has roots in the 8th century BC. Visit the 15th century Palaio Frourio (Old Fortress), which dominates a rocky peninsula, and pause for a drink at the Cavalieri Hotel’s Roof Top Bar. Venture in a northerly direction along Corfu’s mountainous east coast, pausing to bring out the Jet Skis off Barbati, Nissaki, Agniand Kerasia beaches and windsurf and kite surf in Avlaki Bay before cruising south to the Sivota Islands. Afterward, head southwest to Paxos, which, according to legend, Poseidon separated from Corfu with his trident, creating a peaceful place for an interlude with a nymph. Contemplate this myth as you explore some of the sea caves on Paxos’ southwest coast, scuba dive underwater caves and shipwrecks and fish for tuna. Wander around Two-square-mile Antipaxos, three nautical miles southeast of Paxos’ port of Gaios, is renowned for having some of the best beaches in the Mediterranean and Greek varietal wines such as Mavrodáfni. It’s also a great place to stretch your legs for a couple hours. Paths meander amid orchards and olive groves between Vrika and Voutoumi beaches, up to Vigla Village and down to the lighthouse in the south. Mangia Corfu’s cuisine has been influenced by many cultures, particularly Italian. One popular dish is pastitsada — veal or rooster cooked with olive oil, tomato sauce, onion, garlic, cinnamon, clove, nutmeg, bay leaves, pepper and served with spaghetti. Carl Sputh, captain of Starfire, recommends Greece’s northern Ionian Islands — Corfu, Paxos, Antipaxos and the Sivota Islands — for embracing your yacht’s water toys. “Corfu is a nice cruising ground; you can always find calm water [for watersports],” explains Sputh. And, he continues, you can easily circle around 11.6-square-mile Paxos and two-square-mile Antipaxos with Jet Skis. And while you probably shouldn’t use Jet Skis and waterskis between the tiny Sivota Islands (Mavro Oros, Agios Nikolaos, Mourtemeno and Mikro Mourtemeno) you can run them outside, says Sputh. These islands lie just off the mainland village of Sivota, opposite southeastern Corfu, and are often busy with swimmers and smaller boats. Sputh also recommends using Seabobs around the southern part of Mavro Oros up to its Blue Lagoon. Begin your weeklong vacation on Corfu’s east coast, in Corfu Town (Kerkyra). While here, explore UNESCO World Heritage-listed Old Town of Corfu, which has roots in the 8th century BC. Visit the 15th century Palaio Frourio (Old Fortress), which dominates a rocky peninsula, and pause for a drink at the Cavalieri Hotel’s Roof Top Bar. Venture in a northerly direction along Corfu’s mountainous east coast, pausing to bring out the Jet Skis off Barbati, Nissaki, Agniand Kerasia beaches and windsurf and kite surf in Avlaki Bay before cruising south to the Sivota Islands. Afterward, head southwest to Paxos, which, according to legend, Poseidon separated from Corfu with his trident, creating a peaceful place for an interlude with a nymph. Contemplate this myth as you explore some of the sea caves on Paxos’ southwest coast, scuba dive underwater caves and shipwrecks and fish for tuna. Two-square-mile Antipaxos, three nautical miles southeast of Paxos’ port of Gaios, is renowned for having some of the best beaches in the Mediterranean and Greek varietal wines such as Mavrodáfni. It’s also a great place to stretch your legs for a couple hours. Paths meander amid orchards and olive groves between Vrika and Voutoumi beaches, up to Vigla Village and down to the lighthouse in the south. Corfu’s cuisine has been influenced by many cultures, particularly Italian. One popular dish is pastitsada — veal or rooster cooked with olive oil, tomato sauce, onion, garlic, cinnamon, clove, nutmeg, bay leaves, pepper and served with spaghetti. When asked to identify favorite places for jet skiing and other water sports, more than one captain mentioned Magens Bay, a large, calm anchorage in St. Thomas’ north that is surrounded by land on three sides. And the U.S. Virgin Islands’ other islands provide additional opportunities for in-water fun. Fly into Charlotte Amalie, St. Thomas, the USVI’s capital and the most visited port in the Caribbean, and cruise north to Magens Bay to spend the day exercising your Jet Skis, waterskis, wakeboards and Seabobs. The following day, travel south to peaceful Water Island, anchoring in Druif Bay on its western side. Here, snorkel to Honeymoon Beach, visit Fort Segarra (part of the U.S. defense strategy during WWII) and, if it’s Monday, join locals for an evening movie on the sand. If you want to visit the largest USVI, head south to St. Croix, anchoring in the bay at Christiansted. Explore Salt River Bay, where Columbus landed in, via kayak, then return in the evening to experience the bay’s bioluminescence, where glowing jellyfish, glow worms and dinoflagellates create sparkling magic each time your paddle stirs the water. The following day, seek out deeper enchantment, either diving the wall at Cane Bay, which extends along much of the North Shore, or exploring the underwater world around Buck Island Reef National Monument, to the northeast. Afterward, continue north to St. John, where percent of the land is national park. Anchor in Francis Bay, on the island’s north shore, and greet its turtles and fi sh as you navigate its clear waters via snorkel or paddleboard. Finally, return to Charlotte Amalie — and if you’re craving a final dose of fast-toy action, call in to the captains’ favourite — Magens Bay — one more time. Throw in the BVIs Todd Likins, captain of Just Enough, suggests incorporating the nearby British Virgin Islands into your USVI itinerary. Jet Skis are prohibited there, but other toys will get a workout. Likins’ play recommendations include North Sound and Savannah Bay (Virgin Gorda) for paddleboarding and kayaking; Long Bay (Virgin Gorda) and The Bight (Norman Island) for wakeboarding and waterskiing; and Peter Island for diving and snorkelling. Play by the rules Rob Carlin, agent at St. Thomas Cargo and Ship Services, explains that using Jet Skis, Seabobs, waterskis and anything else pulled by a boat is prohibited in USVI national park waters. This includes Buck Island, Salt River Bay and most of the waters surrounding St. John. *Bottoms up * Quench your saltwater induced thirst with a bittersweet local drop named maubi, made from tree bark fermented with ginger root, yeast and herbs. Alternatively, grab a bottle of Tropical Mango Pale Ale, St. John Brewers’ flagship beer. When asked to identify favorite places for jet skiing and other water sports, more than one captain mentioned Magens Bay, a large, calm anchorage in St. Thomas’ north that is surrounded by land on three sides. And the U.S. Virgin Islands’ other islands provide additional opportunities for in-water fun. Fly into Charlotte Amalie, St. Thomas, the USVI’s capital and the most visited port in the Caribbean, and cruise north to Magens Bay to spend the day exercising your Jet Skis, waterskis, wakeboards and Seabobs. The following day, travel south to peaceful Water Island, anchoring in Druif Bay on its western side. Here, snorkel to Honeymoon Beach, visit Fort Segarra (part of the U.S. defense strategy during WWII) and, if it’s Monday, join locals for an evening movie on the sand. If you want to visit the largest USVI, head south to St. Croix, anchoring in the bay at Christiansted. Explore Salt River Bay, where Columbus landed in, via kayak, then return in the evening to experience the bay’s bioluminescence, where glowing jellyfish, glow worms and dinoflagellates create sparkling magic each time your paddle stirs the water. The following day, seek out deeper enchantment, either diving the wall at Cane Bay, which extends along much of the North Shore, or exploring the underwater world around Buck Island Reef National Monument, to the northeast. Afterward, continue north to St. John, where percent of the land is national park. Anchor in Francis Bay, on the island’s north shore, and greet its turtles and fi sh as you navigate its clear waters via snorkel or paddleboard. Finally, return to Charlotte Amalie — and if you’re craving a final dose of fast-toy action, call in to the captains’ favourite — Magens Bay — one more time. 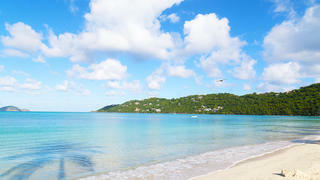 Todd Likins, captain of Just Enough, suggests incorporating the nearby British Virgin Islands into your USVI itinerary. Jet Skis are prohibited there, but other toys will get a workout. Likins’ play recommendations include North Sound and Savannah Bay (Virgin Gorda) for paddleboarding and kayaking; Long Bay (Virgin Gorda) and The Bight (Norman Island) for wakeboarding and waterskiing; and Peter Island for diving and snorkelling. Rob Carlin, agent at St. Thomas Cargo and Ship Services, explains that using Jet Skis, Seabobs, waterskis and anything else pulled by a boat is prohibited in USVI national park waters. This includes Buck Island, Salt River Bay and most of the waters surrounding St. John. Quench your saltwater induced thirst with a bittersweet local drop named maubi, made from tree bark fermented with ginger root, yeast and herbs. Alternatively, grab a bottle of Tropical Mango Pale Ale, St. John Brewers’ flagship beer.